Lean is not just about waste. Lean is about value, which is determined by the customer. Mr. Kano is the inventor of the 3 forms of quality: Basics, Performance Factors and Delighters. 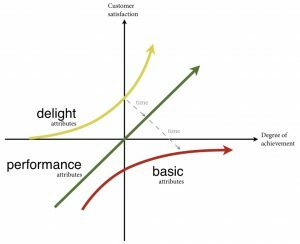 This Kano model and therefore the Voice of the Customer (VOC) is not the exclusive domain of the Marketing or Sales department. The executive departments or teams also provide input and need to know what the VOC is. Delivering in accordance with the Service Level Agreement (SLA) is not sufficient, because the competitors are improving too.